Comparative is used when you want to compare two things. For example one person is tall and the other is short. So you will say: Person A is taller than person B. OR Person B is shorter than person A. You can see some more examples below in the picture. 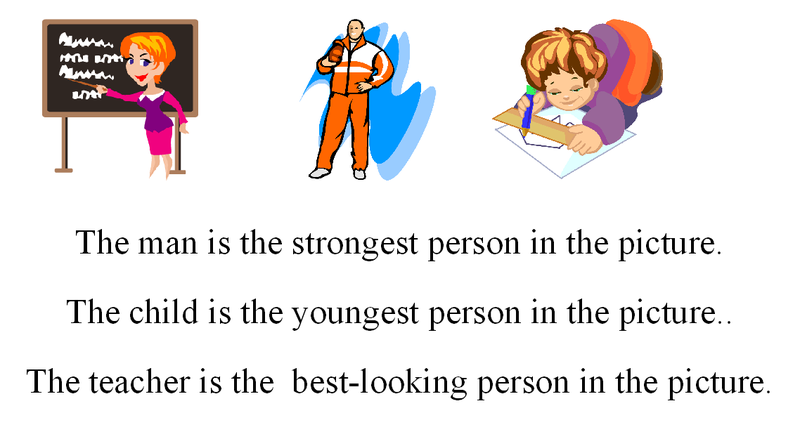 There are several rules in English how to form comparatives and superlatives. First of all you have to decide whether the adjective is short or long. Short adjectives are those adjectives that have one syllable or that have two syllables and end with “Y”. 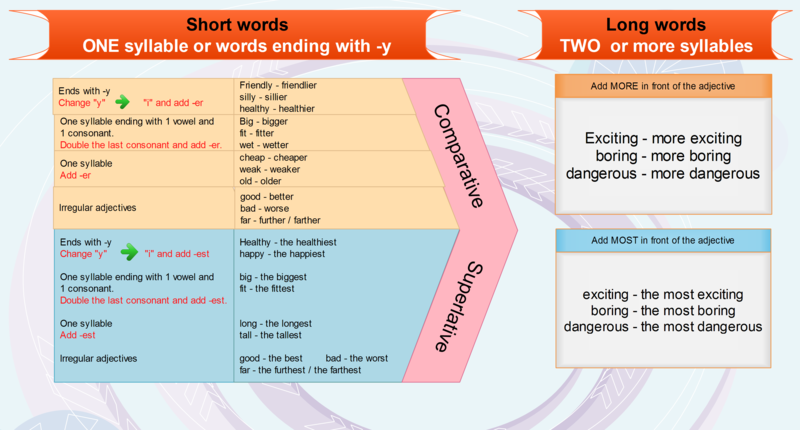 If the adjective is short you add the ending “-er” for a comparative or “-est” for a superlative. There are several simple rules concerning the spelling which you can find in the mind map below. If the adjective has two or more syllables and it does not end with “Y” then it is a long adjective and you have to add “more” or “most” in front of the adjective. You have to learn the following adjectives. So now that you understand the rules how to form superlatives and comparatives in English it is time to practice them in games. In the first game your task is to write the adjectives in superlative or comparative form. Be careful about the spelling. In the second game you have to complete the sentences with the correct form of the adjective. I LOVE your mind maps – so useful! I’ve got a folder full of them for when I cover certain topics with my students, and I frequently see them refer back to them in class. Thank you! Could you give some examples because I am not really sure which adjectives you mean. Futher? It isn’t Further the comparative of Far? Thanks so much for your mind map about The Comparison. I am teaching this lesson. I am very happy if you mind letting me use it in my lesson. There’s a mistake in teacher invaders. It asks for the superlative form of weak, yet marks it as a wrong answer, saying weaker is correct. For the sake of argument, Zdenda and Jacques: could you give an example, please? Thank you in advance. How can I download these images? It’s ok I’ve just managed to do it. Thanks a lot wor your maps, I’ll use it for my students! It’s something innovative and just what I’ve been searching for! Rightclick the image and download it. Yes, there is one. I will try to correct it ASAP. Anyway, it is a really interesting question. Thanks. I completely agree with you. they’re so good for learning and easy to understand.